Click to listen to episode (2:58). From the Cumberland Gap to the Atlantic Ocean, this is Virginia Water Radio for the week of August 19, 2013. This week, we feature another series of mystery sounds. Have a listen for about 20 seconds, and see if you can guess how the first two sounds add up to the third. And here’s a hint: misplaced line makes for a tangled angler. If you guessed, an Osprey running afoul of some fishing line, you’re right! Along with the call of an Osprey—or “Fish Hawk”—and the sound of fishing line, you heard part of a rescue of an Osprey chick stuck in fishing line. 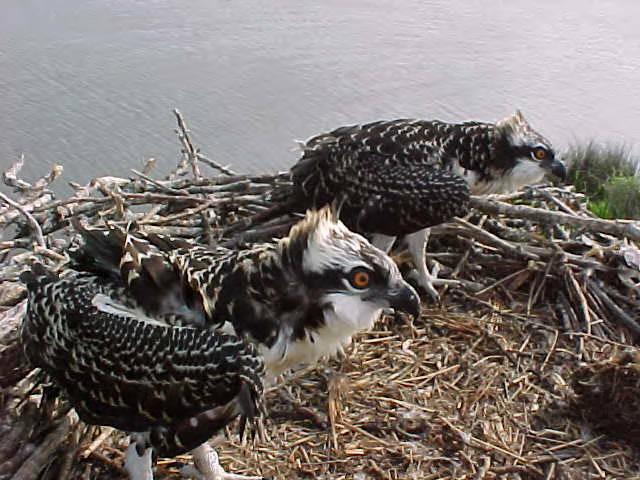 The latter sound was taken from the “Osprey Cam,” the Chesapeake Conservancy’s real-time video transmission from an Osprey nest on Kent Island, Maryland. On July 29, the camera showed that one of this year’s three chicks had gotten its legs caught in fishing line. Some viewers of the bird’s predicament went to the site, waded out to the nest with a ladder, and climbed up and disentangled the chick. Unwittingly, this lucky Osprey chick had starred in a documentary about the value of fishing-line recycling stations. Birds, sea turtles, and other animals can get stuck in, or eat, improperly discarded fishing line, nets, and other plastic items. Such material can also get caught in boat propellers or intakes. Recycling programs for fishing line are one way to help reduce these threats. Virginia began a statewide fishing-line recycling program in February 2009, and as of August 2013, the program had over 110 locations. So please look for the distinctive plastic tubes with a curved top, and help put plastic back to use, instead of on a beak or fin. Thanks to Lang Elliot, Timothy Seaman, and the Chesapeake Conservancy, respectively, for permission to use this week’s sounds of an Osprey, fishing line, and the Osprey rescue. Osprey chicks on nest in Back Bay National Wildlife Refuge in Virginia, 2012. Photo by U.S. Fish and Wildlife Service (USFWS), made available for public use by the USFWS’ National Digital Library, online at http://digitalmedia.fws.gov, accessed 8-12-13. Fishing-line recycling container at South Holston Lake, Washington County, Virginia, April 15, 2013. The call of an Osprey was taken from the Stokes Field Guide to Bird Songs-Eastern Region CD set, by Lang Elliott with Donald and Lillian Stokes (Time Warner Audio Books, copyright 1997), used with permission of Lang Elliott, whose work is available online at http://www.langelliott.com/ and the “Music of Nature” Web site, http://www.musicofnature.org/. The sounds of the rescue of an Osprey chick caught in fishing line were taken from a video recorded by the Chesapeake Conservancy’s “Osprey Cam,” available online at http://www.chesapeakeconservancy.org/Osprey-Cam, used with permission. For more information about the camera or the Conservancy, contact the Conservancy at 716 Giddings Avenue, Suite 42, Annapolis, Maryland 21401; phone (443) 321-3610; e-mail: info@chesapeakeconservancy.org. Information on the July 29, 2013, rescue of the Osprey chick caught in fishing line was taken from Osprey cam chick Ozzie is rescued, [Easton, Md.] Star Democrat, 8/7/13; and from the Chesapeake Conservancy’s “Osprey Cam,” online at http://www.chesapeakeconservancy.org/Osprey-Cam. Florida was one of the first states to start a fishing-line program; information on the Florida program, including advice on starting such a program, is available online at http://fishinglinerecycling.org. A three-minute video on building a fishing-line recycling container is available from the Boat Owners Association of the United States, online at http://www.boatus.com/foundation/monofilament/. Information about Osprey in Virginia is available from the Virginia Department of Game and Inland Fisheries “Fish and Wildlife Information Service” Web page at http://vafwis.org/fwis/?Title=VaFWIS+Species+Information+By+Name&vUT=Visitor; Cornell University Lab of Ornithology’s “All About Birds” Web site at http://www.allaboutbirds.org/guide/search, and the “Birds of North America Online” Web site from the Cornell University Lab of Ornithology and American Ornithologists’ Union, online at http://bna.birds.cornell.edu/bna (subscription required for the latter Web site).